Even though spray paint was technically invented in 1949 by a man, Edward Seymour, it was his wife Bonnie who asked him to come up with it. It wasn't clear what she hoped to do with her paint in a can but my guess is it wasn't painting fabric for her dining room chairs. live with it (and myself) for a long time. I was in love with a fabric and a color that existed only in my head. I'd have to create it myself. And, what's not to love? The new fabric was cheap (painted on drop cloth fabric with 2 cans of spray paint) and easy. The zebra like stencil pattern was cut from poster board and the back side was coated with spray adhesive. The stencil was pressed onto the fabric. I used the darker bronze color first. It's a metallic but it doesn't look metallic on fabric, thank goodness. I sprayed it on lightly -- not saturating the fabric so it wouldn't be stiff. Then, I used the avocado paint to get the illusive color I was looking for. What a gorgeous makeover. I simply love your choice of colors, and what a fun way to make a stencil. You are so darn creative. I love it. How beautiful these chairs look with the new makeover. The before and after are terrific. My DIL has been wanting zebra print for her bedroom, and I believe that drop cloths would work for this. I could paint with a can just like you did. Thank you for the wonderful idea. And not really expensive either, and I do believe it would be heavy enough to keep the sun out. What a great idea-crazy good! I love the fun new look! OMG Lindy I love it!! Wonderful Project! I love the way you mixed spray paints. Wow, are you ever creative! The chair seat re-do looks fantastic! Love the pattern of your stencil, too. Super cool! I love the color and the pattern is just right! I have never tried painting fabric, I love it, it turned out fabulous!! That's amazing - it looks like a very expensive printed fabric. Well done!! super neat idea..the chairs look great! Great job, I love the zebra.It really adds an updated look to your chairs. WOW!!! Love it! Fab job! Thanks for sharing ~ please come by and say hi sometime! The two colors look great together! Love the pattern. What a fun, quick update. I'm lovin your new look too! What a great idea. It really gives the chair a lovely update. This turned out great!! Love the fact that you did it for super cheap too, especially after spending so much on the first fabric. Ahh...the miracles of spray paint...the world would be a lesser place without it! Looks great! I wonder about the spray adhesive though. From my experience, it stays tacky for a while and light colored surfaces tend to accumulated dust and dirt. Did you notice that at all? This is a first. Spray painting with stencils. Neat! Just curious how the fabric feels. It looks beautiful. Love what you did! Looks great, thanks for stopping by Beach Cottage Good Life Wednesdays and joining the party. What a great idea. It turned out so good and you got the color just like you wanted. Hi Lindy! Where do you come up with all these great ideas? The seats look amazing! This could pass for very expensive hand screened fabric. Love it. Great job!! I love spray paint! Lindy, more wonderful artistic creativity from you. Love that design! Thanks for joining the party. This is fabulous! You are one clever and crafty girl! Nice work! Have a wonderful weekend, Lindy! Oh my gosh, this is amazing! I've never thought of spray painting fabric. Way to go. So awesome! I'm from Africa so this really makes me LOVE it! This is so cute! I love the stencil idea for an old worn out chair that I might have thrown away. Great idea. Wow, this is a really awesome look. Very nice tutorial as well. Stunning outcome! I love you because you think of ideas and then you actually do them, rather than sitting around talking about it. 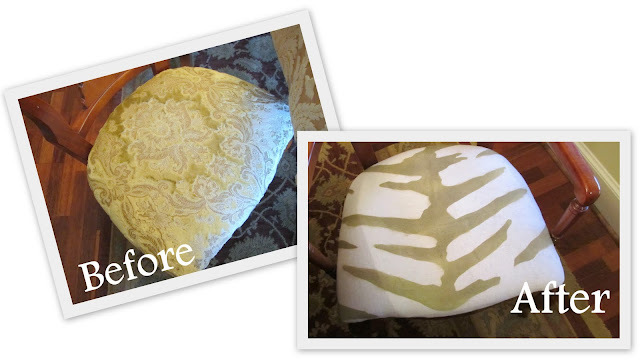 I've been wanting to paint a chair's upholstery, and you gave me hope that it can be done. Thank you! Love your blog!! I am definitely going to be your new follower :) I would love it if you followed me to @ for.the.luv.of.blogspot.com that would be great :) I am just starting out, but I am excited to share new recipes, crafts, and makeup.. And Giving away giveaways on mineral make-up!! Great chair - congrats! I found you via Google when I put in spray painting fabric chairs. Just bought four gorgeous dining chairs off of Craigslist and want to change them to a light grey. Thanks for sharing your results! found this by googling! LOVE it! Gail @ My Repurposed Life has a winner!! !